Stratocumulus clouds are very common types of low-lying clouds. They are commonly thought of as a little dreary. There are many different kinds of these. One of the rarest types is a stratocumulus lenticularis cloud. This is an interesting cloud that is very different from many of the other types of stratocumulus clouds. What are stratocumulus lenticularis clouds? Stratocumulus lenticularis clouds are a subtype of stratocumulus clouds that have an appearance very different from most clouds of this particular type. They are a more wavy, wispy sort of cloud with a very significant appearance that can only be found on one specific occasion. What height are stratocumulus lenticularis clouds found? Stratocumulus clouds are a fairly low-lying kind of cloud. And of course, stratocumulus lenticularis clouds follow suit. Even more so, they are often found a little below the average 8,000 foot level where stratocumulus clouds are usually found. These clouds are a very specific type of stratocumulus cloud that only appears in one situation. They are not formed from any other type of cloud, as many other subtypes of stratocumulus clouds. They seem a little more isolated than most other types among the list of many different types of stratocumulus clouds. They are classified as undulatus clouds within the stratocumulus category, which refers to the wavy shape. How are stratocumulus lenticularis clouds formed? As previously stated, these clouds only happen in certain situations – or one certain situation in particular. This situation happens in a hilly environment. Moist air rises up over these hills and creates the wispy, brush stroke sort of shapes that are known as stratocumulus lenticularis clouds. No other situation can form this particular low lying type of cloud. What do stratocumulus lenticularis clouds look like? It was previously hinted to that these particular forms of clouds look sort of like brush strokes. This is an accurate description. These clouds are thin, wispy, and straight. They have a sort of wavy appearance instead of a puffy one, which fits into the undulatus category of stratocumulus clouds. They are still somewhat heavy and dark grey, but they definitely have a very different shape. How common are stratocumulus lenticularis clouds? 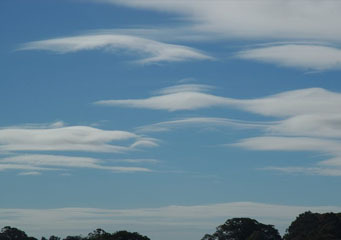 Because of the unique circumstances that form this particular type of clouds, they are naturally a very rare type of cloud in most geographical areas. They only occur over hilly areas in specific weather, so in much of the world, you won’t be able to just walk outside and see one of these clouds. Where can I see stratocumulus lenticularis clouds?